With high-resolution digital mixers, processors and recorders now standard fare, our recordings can sometimes seem too clean and sterile. As a result, there is quite a demand for devices and plug-ins which add a little distortion or warmth to a recording. Many A-D converters incorporate some sort of overload protection that emulates the saturation of analogue tape, and there are numerous plug-ins which simulate the nonlinearities of magnetic tape or valve equipment. However, if you really want the subtle nuances of valve distortion, why not use a valve processor? 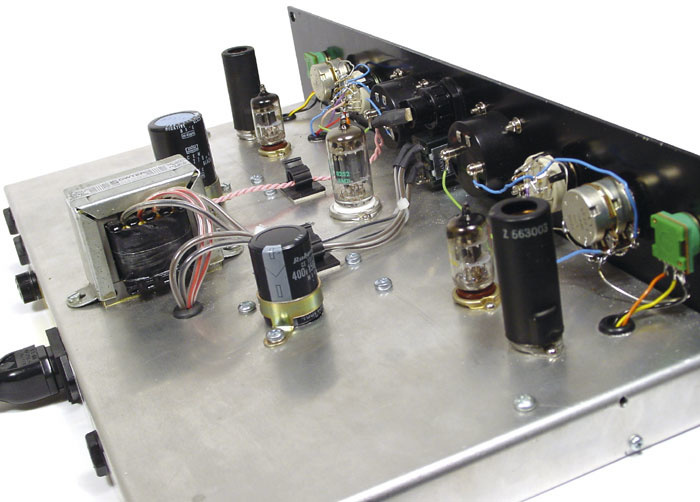 This approach has its followers too, and there are plenty of preamps and other processors that incorporate valves to lend the familiar tube characteristics to the sound — although there are some where the valve is little more than a marketing ploy! Thermionic Culture, a specialist British manufacturer of valve-based audio equipment, can trace its pedigree back to the 1950s, when the company's founder, Vic Keary, built his first studio. He went on to build several more, including Maximum Sound and Chalk Farm, and the all-valve Chiswick Reach. Other key names in the company are the chief designer Jon Bailes, who has a wealth of experience from the electronics industry, and Nick Terry, a highly regarded recording engineer. This 2U rackmount unit is claimed to be 'the first and only valve unit dedicated to producing the best harmonic distortion money can buy.' This seems a fair description — it is certainly a versatile design, with each channel employing an EF86 on the input, a 6AS6 to provide the controllable distortion, and a 5963 (ECC82 or 12AU7 equivalent) to handle the output. The 'distortion' valve's configuration, bias and drive can all be adjusted to provide three different distortion modes, enabling second and/or third harmonic distortion, and with an amount variable from about 0.2 percent to 150 percent. The Culture Vulture exudes vintage charm in its styling and controls, as well as its construction. This machine is hand built in the traditional way, with full-size components strung between tag-strips in the lower section, and the valves, big reservoir capacitors and mains transformer mounted in the top section under a perforated lid. On the review model (serial number VU0050), nothing was quite square or straight, and although the front panel was well finished, everything else looked very homemade, including the labelling of the rear connectors. For many, these imperfections will add to the charm of the unit, but for those who don't like such things, they'll have to stick it in a rack so they can't see them! This is a dual channel line-level unit, with identical facilities on each channel, and it can easily be used for processing a stereo mix, although you obviously need to take care to match all the controls in each channel. The centre of the unit is dominated by a pair of large moving-coil meters calibrated in milliamps to show the current flowing in the main 6AS6 valve in each channel. Between these two meters are a mains power switch and a large green lamp. Below, a pair of bypass switches enable the effect of each channel's processing to be auditioned independently, connecting the input directly to the output and bypassing all of the electronics. The two sets of channel controls are arranged in a mirror-image configuration, which I found slightly confusing. A pair of traditional chicken-head Bakelite rotary controls adjust the Drive (input level) and Bias, the latter setting the current flowing through the main 'distortion' valve. Both knobs are calibrated from one to 11, and the Drive control can reduce the input signal all the way down to complete silence. A three-position rotary switch reconfigures the operating mode of the distortion valve. The 'T' position provides a triode configuration, which generates mainly even-order harmonics. The P1 position gives a pentode configuration which creates odd-order harmonics. The third option, marked P2, provides an alternative pentode configuration which provides far more drastic distortion effects, especially when used with high bias settings. A toggle switch labelled Overdrive increases both the Drive gain and Bias range, for a more pronounced effect. Another small three-position rotary switch selects a low-pass filter, with Off, 4kHz or 7kHz settings. The filter slope is a second-order, 12dB/octave design. A matching rotary control knob adjusts the output level of the channel, again calibrated from one to 11 with unity gain between the seven and eight positions, although this doesn't seem to reduce the output all the way to silence — just very quiet! The rear panel carries four quarter-inch sockets, providing unbalanced inputs and outputs, plus the IEC mains inlet and a fuse holder. The front panel also has a pair of quarter-inch sockets which take priority over the rear-panel sockets, enabling easy connection with instruments. However, the handbook for the unit suggests the input impedance is just 30kΩ for both the front and rear sockets, which is rather low in the context of an instrument DI input. The specifications suggest a maximum output level of +17dBV (about +19dBu), and a noise floor better than 75dB below the maximum output level (ie. around -56dBu). Clearly, it pays to drive this unit fairly hard to maximise the signal-to-noise ratio. The frequency response is given as ±1.5dB between 50Hz and 15kHz (at a low-distortion setting). As you might expect, it really comes down to using your ears to decide on the type of effect and the amount of distortion that is required. However, the current meter does provide some useful information about the status of the circuitry. As the Bias control is advanced, the amount of current flowing through the 6AS6 valve falls, along with the output level. A 'normal' setting would provide between 0.2mA and 0.4mA, which produces a very subtle effect in the triode configuration, not dissimilar to saturated analogue tape. It does seem odd that the meter falls as the Bias control is increased, but such is the nature of the control and the parameter being displayed. If the Drive control is advanced a long way, the amount of current can be seen to be modulated by the audio signal itself, adding to the nonlinearity of the whole process. The majority of the Culture Vulture's circuitry is housed in the lower section of the rack unit, while the main reservoir capacitors, the valves, and the mains transformer all protrude, as you can see here with the external perforated cover removed.Photo: Mark EwingDecreasing the Bias control to set the current to about 0.6mA provides a more obvious 'warm' kind of distortion, adding a nice but restrained 'thickness' to the source. Increasing the Bias control to give less than about 0.1mA 'starves' the valve and gives a rather lean and much quieter sound, with a more 'uneven' distortion, being most pronounced on signal peaks. This starvation effect becomes very obvious indeed when Overdrive is selected, especially if the Bias is pretty high, as only signal peaks manage to break through the circuitry at all! All of the controls except the output control seem to interact with each other to create a wide variety of different characteristics. The Drive and Bias are by far the most critical controls, and small changes to either can have quite a pronounced affect on the sound. Obviously, selecting the different configurations also changes the character of the distortion dramatically, and engaging the Overdrive switch really unleashes the chain saws from hell! The two filter settings of 4kHz and 7kHz are very helpful in turning the mad fizzy settings into something rather more musical. I also found that the tonal quality of the source sound changed quite a lot as I adjusted the various parameters. In addition to the harmonic generation, the overall spectral balance of the sound varied, becoming thinner with higher Bias settings, and seeming to lose some of the high end with lower Bias settings. Because of all these complex interactions, I found it difficult to predict precisely how moving one control would change the sound — it became much more a process of trial and error. However, fine-tuning the controls to optimise the type and character of distortion was always interesting, and the results were always worth the effort. I found I generally used the triode mode for thickening and warming individual sounds or even complete mixes, while the first pentode mode seemed more appropriate for guitars, organs, electric pianos and some special vocal effects requiring a much harder, more aggressive kind of distortion. The P1 mode was also distinctly noisier than the triode mode, although in normal use I don't think the background noise and hum would present a problem. The second pentode mode seemed to combine the best of both worlds, sounding particularly rich. However, strange things happen as the Bias is adjusted, there being a kind of null point of extremely horrid, almost clipping distortion as you get to about 0.5mA — above or below that point the sound is fine, with a proportionate distortion character. Strangely, the P2 mode was also the quietest of all. The Culture Vulture is a very unusual machine, which is going to be something of an acquired taste to many and a fashion accessory to some. However, there will certainly be those who absolutely swear by it and use it on everything. This is certainly a very musical tool which can be used to 'dirty things up a little', adding a little character and warmth to digital recordings, or to create much more overt distortion effects spanning the tasteful to the completely manic! Unfortunately, the machine is not particularly logical to operate, most Drive and Bias settings being found more through serendipity than science. I also found the mirror-image control layout of the second channel really frustrating when processing a stereo mix because I was always finding myself grabbing the wrong controls, but maybe more familiarity would help to overcome this particular foible. Although some users will find the Culture Vulture too unpredictable to set up, and maybe even too quirky for their squeaky-clean digital world, there is no denying that this unit makes an impressive job of providing a very flexible range of distortion effects, covering the whole gamut from almost imperceptible warmth through to seriously vicious overdriven distortion, and everything in between. Definitely one to add to your auditioning list. Mirror image controls for the second channel. Noisier than modern solid-state equipment. 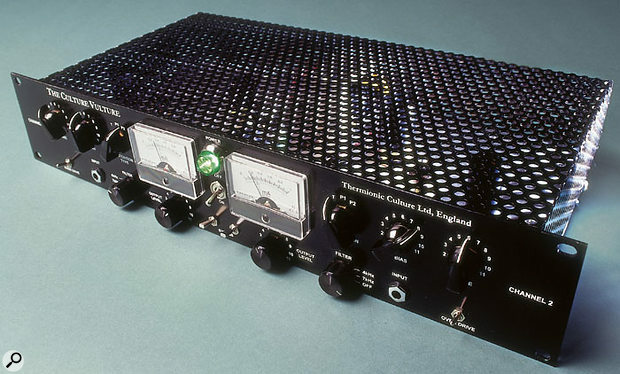 An unusual dual-channel all-valve processor, the very raison d'être of which is to add distortion to your audio. A quintet of controls allows a huge range of effects, from an extremely subtle warmth to mad chain saws from hell! The perfect antidote to sterile digital recordings.